This is grim news: food prices are reaching record levels worldwide. The thousands of farmers who have killed themselves over the past decade seem to have no precedent. According to the UN’s Food and Agriculture Organisation’s director, the goal to reduce the number of hungry people by half will only be achieved in 2050. In Mexico, this is just another facet of the crisis that started in the 80s, when the government dismantled its support for peasant farmers. “My obligation as minister of agriculture is to get rid of 10 million peasants,” declared Carlos Hank in 1991. “What are you going to do with them?” a journalist asked. “That is not my area of work”, he answered. But no one assumed that responsibility. Vicente Fox, former president of Coca-Cola and president of Mexico from 2000 to 2006, used to say “those peasants can be gardeners in Texas”. For him and other policymakers, Mexico had too many peasants; America, their model, was producing food for the world with only 2.5% of the labour force. In 1992 they opened to the private market the land which had been in the hands of peasants since the 1910 revolution. The North American Free Trade Agreement, which came into force in 1994, consolidated this anti-peasant orientation in the name of free market. Those policies drastically reduced food production, and Mexico now imports more than half of the grains it needs. Many Mexicans were forced to emigrate, and a fifth of Mexicans now live in the US. In 1974, the US minister of agriculture Earl Butz coined the expression “food power” – food pragmatically used as a political weapon. Hunger became one of the most profitable businesses of the century: immense subsidies transformed north America and Europe into food suppliers for countries previously exporting food, whose productive capacities were progressively dismantled. Today, OECD countries allocate $365bn a year to that purpose, a number now enlarged with ethanol subsidies: 120m tons of cereals feed cars, instead of people or animals, with no net reduction of emissions. 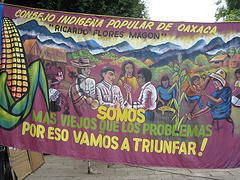 Many Mexican peasants resisted the dominant policies and began to build their own alternative. Without official support, they increased both farmed areas and yields. Migrants invested part of their income in cultivation. Those initiatives are complemented by urban agriculture, following the Cuban example: Havana currently produces more than half of the food it consumes. A trend is settling. Just take a look at Vía Campesina, the biggest peasant organisation in history which started in Latin America in the years of “structural adjustment”. It soon became global and now boasts millions of members. Today, it is one of the main actors in the world food scene, opposing transnational corporations and affirming its food sovereignty paradigm and its new peasant internationalism. Novelist Eduardo Galeano said that in these times of global fear, some people are afraid of hunger and others afraid of eating, aware of the contaminated junk served in their plates. Vía Campesina pressures all governments and attends all the pertinent international forums. But the hope for its members is no longer hanging on the market or the state. They put their hope and trust in their increasing capacity to define what they want to eat, and to produce it themselves. That is our hope. Illinois doesn’t want its police officers acting as immigration agents for the federal government, and the fight between the state and the Department of Homeland Security is heating up quickly.